Matcha tea is the foundation of the ancient Japanese tea ceremony. Shade grown and stone ground the traditional way, this ceremonial, fine grade Matcha is perfect for your favourite coconut/almond/Oat milk lattes or (for those Matcha fanatics) a punchy shot! Tasting Notes: Slightly Sweet, Fresh, Grassy. 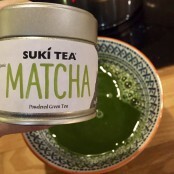 Our Suki Tea Matcha is ceremonial grade matcha. Ceremonial grade matcha is made from the youngest tea leaves, with the stems and veins entirely removed. 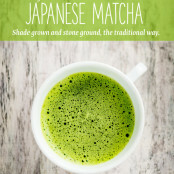 The leaves are stone-ground, which gives the matcha is vibrant green colour and flavour profile. Not all matchas are created equal. One serving of matcha tea, (½ teaspoon to 1 teaspoon, or 1 to 2 grams of Matcha) is like the nutritional equivalent of drinking 10 cups of regularly brewed green tea, this is the King of green tea. Matcha powdered green tea has 137 times more antioxidants than regularly brewed green tea, which makes it an easy and simple way to add powerful health benefits to your everyday diet. 1g (half a level teaspoon) per serving. For an intense Matcha Shot: Add 1g matcha to your cup, whisk the matcha tea in fresh 20-80 degree water until no residue is left in the cup and a vibrant yet dark green colour appears. For a Matcha Latte: Add 1g of matcha green tea to your cup, add a little hot water and whisk until smooth, topped with a steamed milk of your choice - coconut/hemp/soya etc! Rich in flavour, energising, vibrant and incredibly good for you, it’s hard finding a reason not to love it! Service rating : Loved my bundle of tea joy - loose leaf peppermint, chamomile pyramids and a tin of matcha! Ordered and shipped as expected with no issues. Product : I mix a little of this with Apple juice for a fresh taste that gives me a gentle but prolonged energy. One in the morning is all I... Service rating : Loved my bundle of tea joy - loose leaf peppermint, chamomile pyramids and a tin of matcha! Ordered and shipped as expected with no issues. Product : I mix a little of this with Apple juice for a fresh taste that gives me a gentle but prolonged energy. One in the morning is all I need for the day. Oooh sounds lovely! The perfect mix for a busy day ahead. The Mach tea has no flavour at all, no matter how small the amount I have used it will not go clear, the residue is like paste and leaves a powdery taste in my mouth, in short I am not happy with this, am going to see if it can be blended with one of my other tea’s to give it some colour. In short I am... The Mach tea has no flavour at all, no matter how small the amount I have used it will not go clear, the residue is like paste and leaves a powdery taste in my mouth, in short I am not happy with this, am going to see if it can be blended with one of my other tea’s to give it some colour. In short I am not happy with it. Service rating : Great and timely service and lovely products. Particularly the organic Green Matcha. It's effortless to order. The tea is excellent. And it reaches me quite quickly. And prices and freight cost is good. What more can I wish?